TROLLS: Thin and rubbery, loathsome Trolls are able to regenerate, so that beginning in the third melee round after one is hit it will begin to repair itself. Regeneration is at the rate of 3 hit points per turn . Even totally sundered Trolls will regenerate eventually, so that unless they are burned or immersed in acid they will resume combat when they have regenerated 6 or more hit points. In strength they are about equal to an Ogre, but as they use only their talons and fangs for weapons, only one die of damage is scored when they hit an opponent. Finally there's a little meat to a description - D&D trolls are strange, and different from folkloric descriptions, coming most likely from Poul Anderson's novel 'Three Hearts and Three Lions' which describes a similar creature. 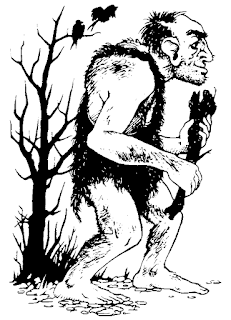 Whatever the source, the D&D troll is a bestial creature with talons and fangs, and a unique appearance of rubbery emaciation that has persisted throughout editions. Trolls have always seemed to me to be some sort of giant ghoulish cannibal, skulking about in total filth encrusted barbarism, dumb but always hungry. 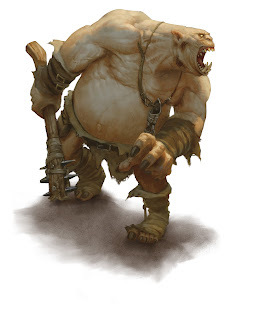 Trolls though are also homebodies, or perhaps ambush predators spending 50% of their time in lairs, as opposed to the 30% of other large humanoids - though unlike Ogres and Giants, troll lairs aren't guaranteed to contain treasure, and they don't carry any around with them. This bare description almost paints a picture of the troll - a skulking, defensive creature, perhaps an opportunistic hunter, and it is very easy to see how they became the feral swamp dwelling terrors that I think of them as from B/X and AD&D. This is not however a product of Monsters & Treasure, but of later editions. The Whitebox Troll may live among orcs, just like the ogre, making it much like the Tolkien Troll (Both Ogres and Trolls share a kinship with the brutish 'heavy artillery' of Sauron) even if the description is quite different. The Troll is also a very dangerous monster, in a somewhat different way then the Ogre, with it's regeneration ability and large HP pool it's defensively minded and hard to kill. Even if the OD&D Troll is only a 6+3 HD creature with a single attack that does normal weapon damage, compared to later editions with multiple attacks and higher HP trolls should be able to outlast a party of adventurers in melee combat. I also note that there is some confusion in the description about how quickly trolls regenerate. Apparently they recover HP every 'turn', which would imply very limited HP recovery during combat, but then the text mentions a troll returning to combat after recovering 6 HP. However the ability is read, it is very interesting, and trolls that regenerate after combat are a frightening monster to only a slightly lesser degree then those that regenerate more rapidly - as long as the party doesn't know the trick of burning the bodies - and it seems likely that a burning troll might jolt up returning to life amid its funeral pyre. Personally I am inclined to think Trolls regenerate 3HP of damage each combat round, making the troll heal an average wound every round, and providing them with a special ability that is mythic feeling, better than the ogre's high damage potential, and terrifying. Trolls are also notably a melee focused monster (more so then even ogres, who can use weapons, including missiles), but far more defensive then ogres or giants, with a higher armor class then ogres and their regeneration ability. That they only use their natural weapons and seem indifferent to wealth suggests that Trolls have a more bestial nature then other large humanoids, or are operating on a different set of goals (perhaps hunger, perhaps otherworldy imperatives). Hill Giants are the most common (60%) while others are seldom encountered (10% each type, 40% total). Those Giants who abide in castles sometimes have additional guards. There is a 50% chance that some other monster will be there: die 1 - 4 = Hydra of from 5 - 10 heads; die 5 - 6 is either from 6 - 36 wolves or from 3 - 18 bears. greater than one die of damage in the Little Brown Books, and while ogres and trolls are low and mid level monsters, giants are in the highest tier of dangers along with hydras and dragons. Notably, giants don't really have a gimmick, giants just crush the heck out of players in melee combat and some hurl boulders for equally massive damage. I have never been fond of using Giants in my game, they seem to large to really stick indoors and for whatever reason I always skip over them when I think of monstrous foes. That isn't to say Giants don't make good opposition, but like all large humanoid Giants are a straightforward 'fighter' style monsters without tricks and gimmicks. 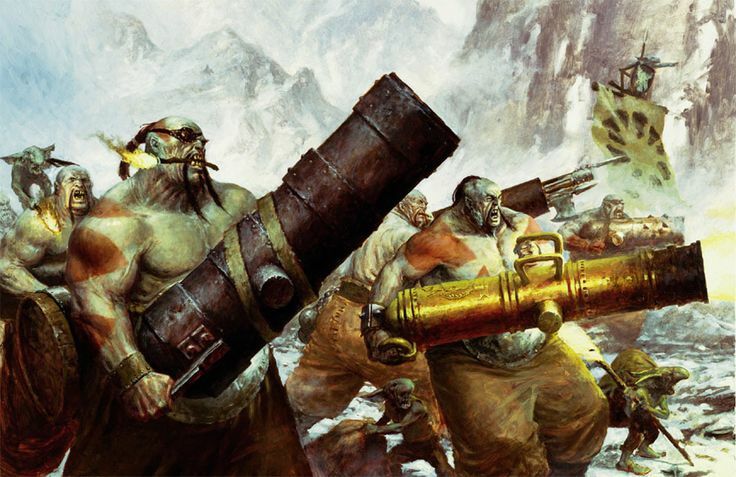 They have high HP totals and do large amounts of direct melee damage while operating in fairly large groups (3-18 for ogres, 2-12 for trolls and 1-8 for giants) - a straightforward combat challenge. Giants have considerably more flavor then Ogres or Trolls, and a list of optional sub categories like Dragons. Unlike Dragons, Giant subcategories seem to suggest a variation of culture and sophistication among Giants, from cave dwelling Hill Giants and Stone Giants up through Cloud Giants in their castles, who keep dangerous animals as pets or guards. In addition to their organization Giants carry treasure on their person, and have large hoards in their lairs, something that suggests they, like ogres, are not without avarice or other human impulses, perhaps even the desire for comfort, safety and peace. That they build defensive structures in the form of "castles" (or take them over, but for some reason building them seems more likely). The possibility that Giants are intelligent and reasonably civilized leads to the interesting prospect of roleplaying encounters with the creatures. Many of the older TSR adventures, especially though clogging up Dungeon magazine, have focused on this aspect of giants, putting them into settlements where the giants' HD makes direct confrontation a questionable choice even at higher level. While this impulse is understandable in the very organized world of AD&D/80's and 90's TSr, where giants are the last rung on the power ladder of humanoids that starts with kobalds this is not how giants appear in OD&D and it seems a boring way to use such an iconic and mythical creature. Much like dragons, giants are powerful enough to deserve a place in the game world, with legends and names given to them, rather then simply providing a high level combat challenge. 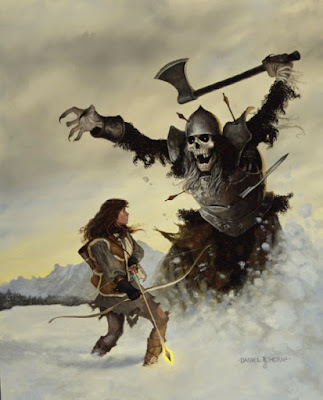 In OD&D, with it's relatively flat power levels the abilities of giants are sufficient to provide this level of challenge, but against the inflation of character power in later editions (even Basic and Expert) giants might need some increased power (damage reduction, attacks that strike multiple targets etc) to be individually challenging. Ogres are clearly human, just modified and bent by unconstrained magic. Ogres are rarely the product of intentional manipulation, and most often the result of exposure to magical sinks and pollution, as such these sports vary considerably in appearance and intelligence from large, perfectly muscled, handsome idiots to misshapen animal faced geniuses. The behavior of Ogres can be savagely predatory or productive and open based on the community they find themselves born into, their innate temperament and the way they are treated by that community. Ogres are not uncommon working in out of the way villages, leading the charge in a rural militias, or acting as the house karls of a backwoods nobles, many of whom offer rewards for children with ogreish features. In the hinterlands of Empire where magical sinks abound, and life if a constant struggle against pollution and sorcerous contagion an Ogre child is less a cause for concern and their strength and strong resistance to disease will make them valued community members. The more civilized and less magically polluted communities of the Central Provinces (Green Hive and Tilpidy Town for example) are more likely to shun ogre children or even execute them in childhood, if their mutations or behaviors are too monstrous, yet there's a place for most Ogres in civilized land. Even in the Capital the Imperial Cult of the Living Emperor actively recruits Ogres into the ranks of the Imperial House Guards, and the crumbling spindle of the Imperial Palace is filled with hulking guards in white plate armor, though it is said that many of these are the products of monstrous programs of inbreeding and magical experimentation. The wars that destroyed the True Empire and birthed the Successor Empire are over. The Demon Emperors, their cabals, slave armies and demonic machines crushed and driven into exile by the Throne Legions, the Silent Empress, her War Titans and the forces of humanity that flocked to her banner. However, even though humanity, the Celestial Thrones, and the Successor Empire achieved ultimate and total victory, the conflict was titanic and so much of the knowledge and power of the Empire was destroyed and shattered, or left to rot and curdle in the magical wastes that blanket what remains of the Imperial Heart Provinces and pock the rest of the Empire with magical sinks. Just as wrecks and blast craters bleeding arcane pollution into the environment are a frequent and constant peril, so are remnants of the summoned outsiders that both demons and thrones used to bolster their armies. The most disposable (and hence most often left to wander or abandoned when injured) were spirit and demon hosts, stretched and swollen to outlandish proportions. These undying hosts are now a plague in the outer edges of the Provinces and even in the Resurgent Kingdoms as they wander, largely immortal, and without direction. Both demon and throne spirit are quick to anger and violence, often reverting to or relishing cannibalistic predatory behavior. The worst are also capable of interbreeding with humanity and small colonies of these half demons or half angel humanoids eek precarious existences at the edge of the magical wastes. There always needs to be room for this guy in a setting. Spirit Hosts are unspeakably strong, faster and most of all resilient, there bodies healing from injury almost as quickly as it can be delivered. What spirit hosts are not is sane, regardless of the origin of the outsider entity bound into their human bodies, the conflict between human and alien leaves little of each intact, especially after year or decades or eons. Some are crafty and sly in their madness, speaking and planning almost as a normal human might, but for goals that make no sense. Most are gibbering beasts that hunt and kill, skulking in abandoned places, sheltering among the ruins and waste places of the earth. All are dangerous, merciless and untrustworthy. Worse then spirit hosts are the outsiders summoned whole into the terrestrial world to fight. These powerful and enduring creatures range from simple brute demons and mute seraphim that crouch on ancient battlefields lashed by dust and rain, waiting for hostilities to resume, to sophisticated choirs and barons of the pit. The more advanced of these forgotten interlopers often take over or construct homes for themselves and attract of create households of other outsiders or warped creatures to serve and defend themselves. Most however simply wander, collecting items they value and acting on unknowable impulses that often lead to destruction. Your re-skins are quite nice, though I prefer your ogres and the trolls to the (demonic) giants. Still very nice. OD&D often mixes the term "turn" when "round" appears to be meant. OD&D combat was derived from Chainmail where battles were fought in one minute "turns." While turns are later distinguished in Book 3 to mean ten minute segments, the troll regeneration appears to mean rounds (as is clarified in all future publications, beginning with the Monster Manual). Absolutely right on the 'turn' v. 'round' distinction - though both possibilities present interesting options here. Given that some Spirit Host versions of the Troll might have non-fire or acid vulnerabilities (heck it might not have any vulnerabilities beyond exorcism or dispel magic - I'd do that)one that comes back in 30 minutes or so would be quite nasty as well. The giants aren't just demonic, also angelic. Such is that setting. Thing is I don't cover giants as much, because basically if I get to using giants they're going to be unique monsters (like dragons and likely have 'monstrous beast' mechanics as well as names and such. Yeah, I get where you're coming from. In my game designs (most recently based on OD&D and Holmes Basic), I've defaulted to topping out "giants" (I don't do the different types) at 8HD with anything greater being unique creatures. Something 12' tall (eight times the mass of a human) is as large a scale as I want for combat with adventuring parties...that's heroic. Anything bigger is frigging MYTHIC...like Thor fighting frost giant stuff. And that's a little more power than I run in my D&D games these days. Shouldn't something 18' tall have, like, 24 hit dice? This is a really excellent Christmas present. I like your analysis of the giant-types in early D. I will have to look at how they are handled in Holmes (identically iirc) and B/X to see what kind of early differences there are.